Waseda University is a large, private university, originally founded as Tokyo Senmon Gakko (Tokyo College) in October, 1882. 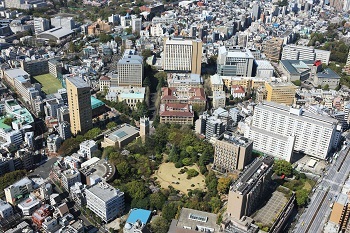 The college was commonly referred to as Totsuka Gakko because of its location in Totsuka Village and Waseda Gakko because the founder, Shigenobu Okuma, lived in Waseda Village. The school became formally known as Waseda Daigaku (Waseda University) in 1902. It started as a college of Political Science, Law, English and Physical Science and has since grown to include 13 Undergraduate schools of study and 24 Graduate schools. The university is located in Shinjuku, Tokyo. Watch this video for a virtual tour of Waseda University! Japan, also known as the “land of the rising sun”, contains over 3,000 individual islands known as the Japanese Archipelago. These islands are mostly mountainous and many are volcanic. Japan continues today to be a constitutional monarchy. Japan’s traditional culture is known as Jōmon, but today’s culture is greatly influenced by other Asian countries, Europe and North America. One such influence is the emergence of pop music in Japan, known as J-pop (similar to K-pop, from South Korea) and is quite catchy! Despite the outside influences, the spoken language is still 99% Japanese and the religion remains 84% Shinto (indigenous religion) and Buddhist. Japan is well known for its beautiful cherry blossoms the bloom in the Spring. You should consider attending a cherry blossom festival while you are there! Tokyo is the capital city of Japan and is one of the world’s most populated cities with 38 million people. Tokyo is located on the southeastern side of Honshu, the main island, in the Kantō region. Tokyo is technically not just a city, but is a metropolitan prefecture. Tokyo is home to the largest fish market in the world: the Tsukiji Fish Market. Another attraction in Tokyo is the Kabuki-Za Theater which houses traditional Japanese performances. Japan is often associated with Geisha, in Gion, a neighborhood in Kyoto. Tourists have the opportunity to see traditional tea houses and clubs and possibly even a Geisha in full make-up and dress. Kyoto also has one of the most famous Zen rock gardens, Ryugen-in Temple, which has been around since the 15th century. Tokyo is also home to the famous Robot Restaurant. There are a number of exciting things to see and experience from the new to the very old. Waseda University offers courses in English in the following fields: Art History, Biology, Biochemistry & Microbiology, Business, Chemistry, Communication and Journalism, Computer Science, Economics, Education, English Language & Literature, History, International Affairs, Mathematics, Political Science, Psychology, and Sociology. Estimated budget for one semester at Waseda University. *Fall is not applicable as a semester only option because our calendars do not align. See the Academics page to view available calendars. As a rule, Exchange students must select their courses from those offered by the school they will be affiliated with at Waseda. In some cases, you may be permitted to take courses offered to all students or courses offered by other schools as well, but your study plan should be focused on the courses offered by the school for which you are applying. To find courses in English, you can use the Course (Syllabus) Search. You can also check this department course list and make note of any restrictions there might be for exchange students and view specific departments. Full-time enrollment: Students must enroll in at least the equivalent to 12 UMaine credits. It is recommended that students enroll in up to 15 UMaine credits. Most courses at Waseda are either 2 or 4 Waseda credits. You would typically enroll in at least 7 courses, equaling 14 credits but could enroll in up to 20 credits, depending on the school. The number of credits students can enroll in per semester differs according to each School. For example, students on the Japanese Language Program (JLP) must take a minimum of 13 credits per semester, and can take up to 18 credits per semester. Students in School of International Liberal Studies (SILS) must take a minimum of 14 credits per semester and can take up to 21 credits per semester. You can find information on the maximum and minimum number of credits each School allows students to take under “Details and Restrictions related to Course Registration”. Transfer Credits: 1 Waseda Credit is equal to 1 UMaine Credit. It is compulsory to join Japan’s national health insurance. The amount of the premium you must pay varies by city or ward but it is usually about 1,500 yen per month ($14). You are also required to purchase travel insurance before leaving for Japan. Most international students live on-campus. Students can live in Waseda University Student House South Wing/North Wing, Waseda University Nishi Waseda International Students’ House, or Waseda Housien. Accommodations typically come with a shared kitchen, lounge and bathrooms, while there are a few options to have a private bathroom.